Currently on one host you can create up to '''8 virtual machines''' and up to '''8 virtual interfaces'''. Workaround to have more than 8 interfaces in total is to use VLANs. In future versions it will be possible to add up to 16 virtual machines. 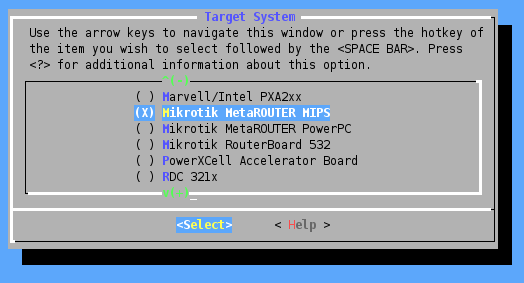 Go to Target System menu and choose ''Mikrotik MetaROUTER MIPS'' or ''Mikrotik MetaROUTER PowerPC'' from the list depending for which platform you are building the image.